Can you spot the endangered species? Alan Brech Joke explained: see the Sandhill Cranes (A) are out in the middle of the street in a disorganized group ready to get hit by cars; and there’s no crane food in the road anyway so wtf? whereas the Ibis (B) are in a tight little group eating bugs galore and not out in the street. Given that, which one is endangered? Moral of the joke (jokes have morals too, they’re just sick): some of these endangered species are stupid fucks. 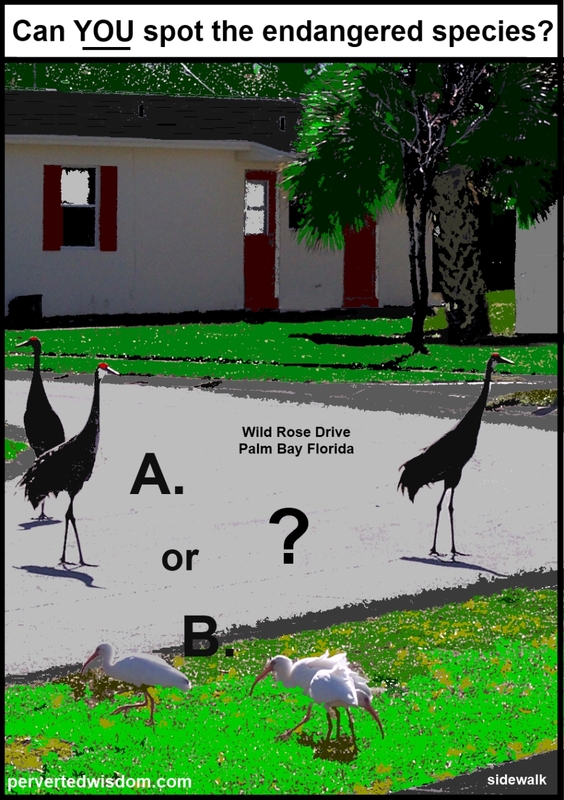 This entry was posted in humor, photo quiz, Uncategorized and tagged endangered species, florida wildlife, ibis, Palm Bay Florida, sandhill cranes, suburban sprawl, wildlife in suburbia by Alan Brech. Bookmark the permalink.